Why review a book on Irish republicanism written by a long-standing member of the bloody, racist, imperialist British Labour Party? Because socialists needs to understand the significance of the revolutionary national class struggle against imperialism and for socialism, particularly with developments in Latin America. Woods’ analysis of Irish republicanism totally fails in this respect. Indeed, his book is an example of a trend which Lenin called imperialist economism, and which today expresses the interests of a narrow section of the working class – the labour aristocracy. Woods says that ‘the only way to solve what remains (sic) of Ireland’s national problem is as a by-product of the revolutionary struggle for socialism.’(p127) He continues: ‘There can be no reunification of Ireland while the working class remains divided along sectarian lines’ (ibid). He concludes that ‘It is time to put an end to the sectarian divisions that have bedevilled the working class of the North of Ireland for so long’ (p129). This will be achieved by fighting ‘on issues that unite working people, not those that divide us’ (p130). But these fine words are really no more than idealist drivel which in the end capitulates to imperialism. What follows from this? Frontiers, including the one that separates North and South, can only be abolished by socialist revolution. Therefore the issue of frontiers (ie self-determination) should not be posed as a concrete question today because it cannot be resolved under capitalism. Hence his utterly one-sided view that ‘The whole history of the national liberation struggle in the 20th century shows...that the achievement of formal independence on a capitalist basis has solved nothing’ (p131). Lenin’s position was clear: socialists in imperialist nations must support the right of oppressed nations to self-determination down to an uprising or war. Does Woods agree with this? You cannot find out from his book. Lenin argued that imperialist economism had both a left and a right face. Woods presents the right face: for him anyone who engages in struggles for national independence is by definition subordinating the interests of the working class to those of the national bourgeoisie. Hence they must be opposed and condemned. In the case of Ireland, this means attacking the IRA. Woods justifies his position by distorting Marx, Engels, Lenin and Connolly. Although Woods seeks justification for his position in Lenin and Connolly, as an imperialist economist he feels much more at home with Trotsky’s generalisations. Lenin, however, never adopted Trotsky’s perspective; to think that he did would be to ignore his contribution to the debate on self-determination at the Second Congress of the Third International where he pointed to the vital importance of supporting the revolutionary nationalist struggle against imperialism. Nor was Connolly a Trotskyist. He could not have made himself plainer when he asked a few weeks before the Rising: ‘Is it not well and fitting that we of the working class should fight for the freedom of the nation from foreign rule, as the first requisite for the free development of the national powers needed for our class? It is so fitting’ (cited in Reed, Ireland: The key to the British Revolution p25). You would not know this from reading Woods. 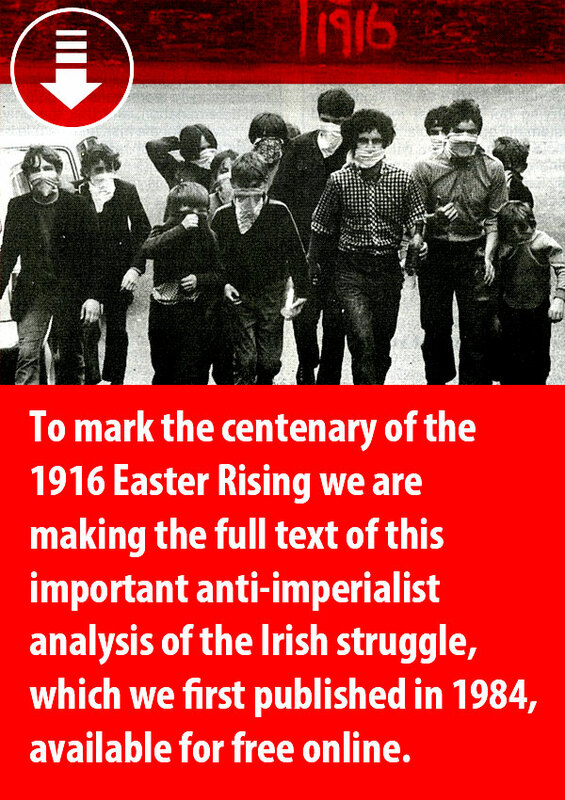 Yet it is this doctrine Woods wants the Irish movement to pursue: ‘A programme based on issues that can unite the class: jobs, wages, conditions, housing, women’s rights – only the struggle for this can succeed where all else has failed’ (Woods, p126). Connolly may not have used the term ‘imperialist economism’, but this is what he was dealing with – the Woods of his day. So the ‘Marxists’ were not against the introduction of troops at all! Indeed, ten years later, they were describing those who called for the withdrawal of British troops as ‘attorneys for the Provos’ (Bulletin, November/December 1979). Needless to say, Woods makes no reference to this either. Out of countless examples of Woods’ capitulation to imperialism, we will take just one. His account of the struggle of the 1970s against the criminalisation of Republican prisoners ignores the crucial role of the 1974-79 Labour government in establishing a regime of institutionalised torture and repression. Although he now seems to endorse the struggle led by the Relatives Action Committees (RACs) in support of the prisoners it was a quite different story at the time. The article is silent on the prisoners’ struggle let alone the role of the RACs. Woods’ arguments express the interests of a privileged section of the working class, the labour aristocracy. His defence of the Labour Party, his opposition to armed resistance to the British occupation, his re-writing of the shameful history of his organisation, his misuse of Marx, Engels, Lenin and Connolly all have a purpose: to keep opposition to British imperialism within the confines of bourgeois respectability. Together they amount to a deeply reactionary standpoint.